Otaki Castle (大多喜城) is the hill top castle located in Otaki, Chiba. It was built in 1521 by Nobukiyo Mariyatsu. In 1590, Tadakatsu Honda(本多忠勝), the great general of Ieyasu, moved in this castle to control Satomi Family and built stronger castle at the same place. However, the tensyu-kaku, the main keep, was burned in 1842 and never be built. Current Tenshu-kaku was built in 1966 based on the original design note which is not based on the castle built by Honda, but the original one by Mariyatsu. However, there is no qualified proof that Tenshu-kaku was existed. 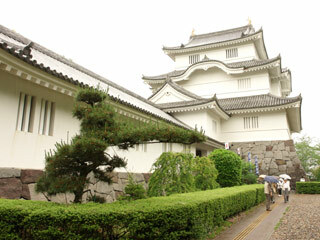 The current Castle is now also used as the museum which has great samurai sword and armors including historic notes. In 1609, Spanish General Don Rodrigo visited Otaki castle and he said “he had never seen such well designed and structured Castle in his life.” The hill is very high and opens full sight, half of the bottom of the hill is surrounded by river. So, it was strategically important castle to rule the half of Boso Peninsula. At the museum, there are many historical items displayed including, samurai swords, armors, pistols, and all other art works and books. It offers the life of old Boso Peninsula during the period of the Sengoku and Edo period for you.